Eagle Rock – O Hei There! The Oinkster: where all the hipsters in Eagle Rock congregate. This was proven true during my visit with Greg a few weeks ago. We came around 6pm on a Friday, and it was surprisingly not too busy. However, after we ordered and sat, the line was out and around the restaurant. Guess hipsters come out to play around 6:30 – noted. Anyways, The Oinkster is a well-received restaurant that specializes in burgers and sandwiches (featured on Diners, Drive-Ins, and Dives, as well as in more blogs than you can count, and most importantly to Angelenos – J. Gold’s 99 Essential Restaurants). They also offer a variety of beers, both on draft and in bottle, as well as artisan soda and coffee, and my favorite: shakes! I ordered the famous house cured pastrami, as is, since I wanted to taste the pastrami meat in detail. Greg ordered the Royale, which is essentially a pastrami burger. 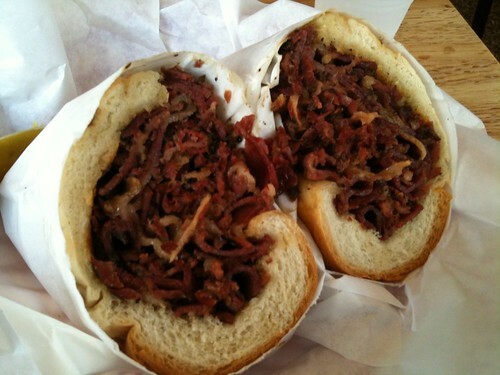 According to their website, the pastrami is “cured for two weeks, rubbed with special Oinkster secret spices and smoked with applewood.” Sounds amazing, no? Expecting Langer’s-esque quality, I was not. But one cannot help but have high expectations, especially from reading that Chef Guerrero improved the pastrami after studying briefly with the Langers. What I ended up with, however, were thin slices served on a French roll. This is very similar to the pastrami you’d find at The Hat and Johnnie’s, not exactly what I was desiring and expecting. The pastrami itself was full of flavor. Maybe a little too well-seasoned though. Yes it’s cured and I can certainly appreciate and handle well-seasoned food, but I felt that the pastrami here was a bit too salty, at least salty enough to overshadow the peppery and smokey flavors that were promised. The thin slices were a bit difficult to appreciate from the texture perspective, as well. And adding to the disappointment, the roll was unspectacular. Maybe I’m too much of a pastrami sandwich traditionalist, but I haven’t exactly been pleased with these types of sandwiches mentioned in the previous paragraph. 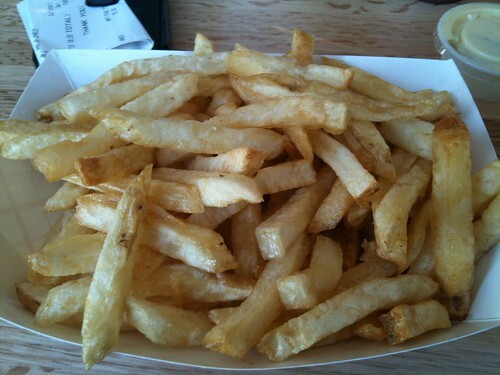 The fries, done Belgian-style, were also a bit of a disappointment. I felt that, while they tasted pretty good, the fries were too soft and limp. 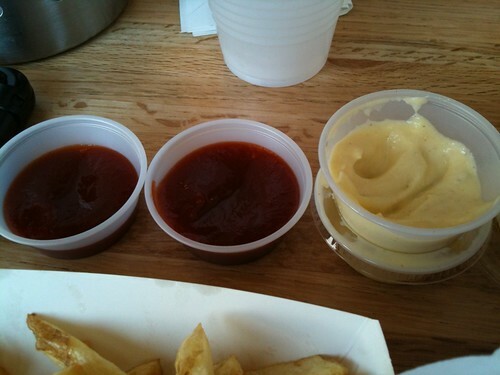 But they did go well with that garlic aioli, which certainly lived up to its name (very garlicky). All the disappointment over this meal, however, briefly went away once I received my ube shake. 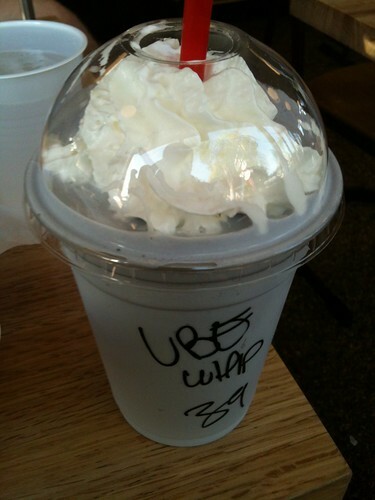 Made with Fosselman’s ice cream, the ube (purple yam) shake was delicious! If I had to describe it, it was like a marriage between coconut and taro flavors. Truly the highlight of the dinner. Despite my disappointment, I can see why The Oinkster is so popular: decent quality and prices in a fun and casual atmosphere. Definitely a place I would’ve loved had it been in Westwood during my college years. With my somewhat-quarterly-trips to Forest Lawn during the past year (to make up for being a negligent grandson all these years), I decided to give myself a goal to scope out a new restaurant to try near the Hollywood Hills area, somewhere I normally wouldn’t drive to due to distance. 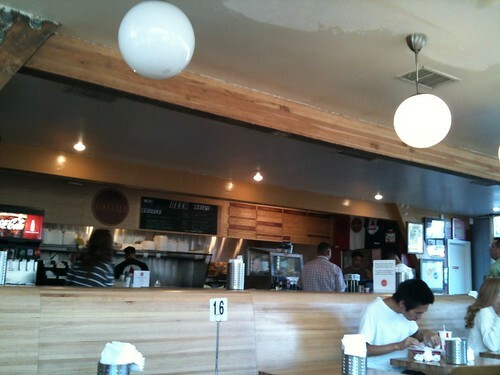 The first place I tried under the new initiative was Jinya in Studio City, and that proved to be successful. This time around, I headed east to Eagle Rock, since I never go to Eagle Rock. After looking at my lists of to-dine places (not only do I have an actual list, I have multiples), it was basically down to CaCao and Larkin’s. But once I started researching the former and the words “duck carnitas” appeared, it was game over. I kept reading about CaCao during the days leading up to my visit, and was mesmerized by their wide selections of authentic and unique Mexican dishes, in particular their tacos. Duck confit (the “duck carnitas”) and duck skin? Drool and drool – I mean, drool^2. It was cold and wet at 11am that Saturday morning (it rained that weekend two weeks ago here in L.A.), but once you step in, it became warm and cozy. 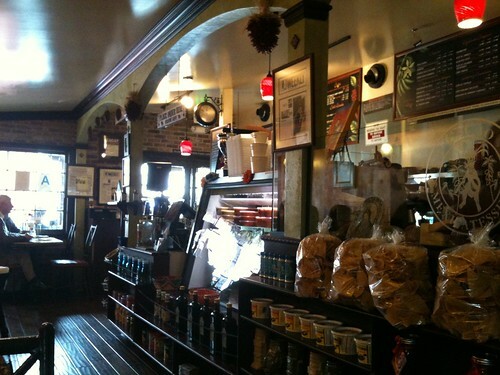 The interior looked like a cool Mexican Starbucks of sorts, and you order at the counter that is in right in front of you went you enter (FYI: there are two doors – enter the right one. Left one is a flower shop). There’s even a deli counter of sorts where you can buy various stuff like sauces, etc. If I was a hipster Mexican and lived in Eagle Rock, this would definitely be my hangout place. Having read up on the place before arriving, I had an idea of what I wanted to order. They do, however, have a chalkboard of daily specials, one of them being sea urchin tacos. Uni tacos? Drool^2 x2. I was also tempted by many other things on the menu, including the breakfast items that I saw on some tables. But I was determined to try their tacos. 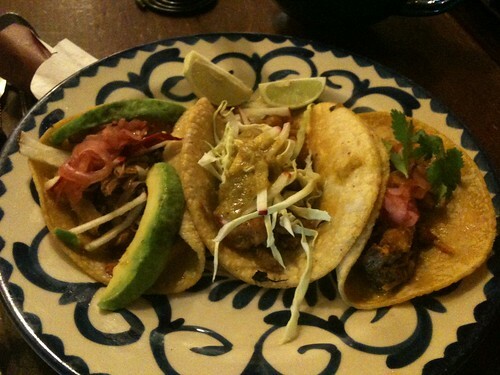 I decided to order three tacos – the duck confit, the duck skin, and the cochinita pibil. Since it was a cold day, I also ordered a hot cacao (chocolate). Then I grabbed my number and took the last available table inside. Because I loved it so much, I ordered another duck taco to-go (I was possessed by fatty Hei, but managed to fight him off and save this for dinner that night), as well as the wild boar one (which the nice guy at the counter recommended, along with the oxtail one – trying that next time). The wild boar one wasn’t gamey at all, but had a bit of a rough consistency with it being grounded. Still good though. I like how most of the tacos (and I’m sure this extends to their sopes and burritos as well) have some variety ingredient-wise from option-to-option. They beg to be tried. 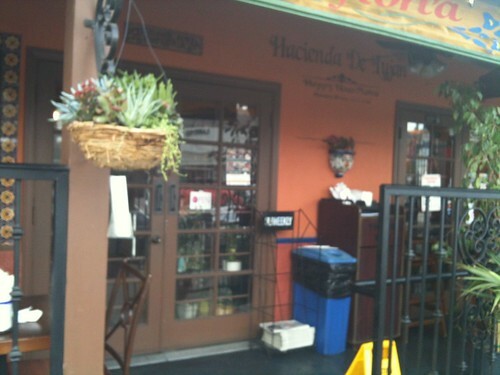 They are a bit more expensive than normal tacos, but the quality and taste more than makes up for it. Each of the corn tortillas are homemade. A bit thicker than normal ones, they were the perfect vessels for the various fillings. After my lunch, I had told a few friends that these were arguably the best tacos I’ve had in years. I can safely say that these were some of the best tacos I’ve EVER had. I will definitely be back to CaCao to try more of their extensive menu (like the chile rellenos that Jonathan Gold also raved about) – and ordering a few duck tacos to-go. 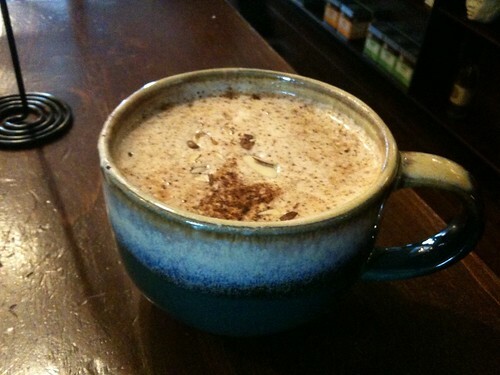 Hot Cacao ($3.95) – Oaxacan cacao with cane sugar, cinnamon, & almonds. Left: Cochinita Pibil Taco ($3.25) – smoked pork in achiote, citrus, & Yucatan spices. Topped w/ sour red onions & cilantro. 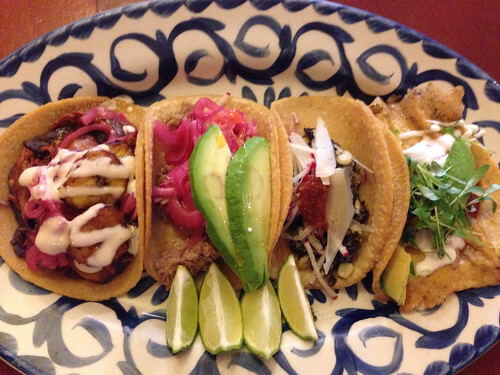 Middle: Chicharron de Pato Taco ($3.25) – fried duck skin, cabbage, radish, onion, cilantro & salsa verde. 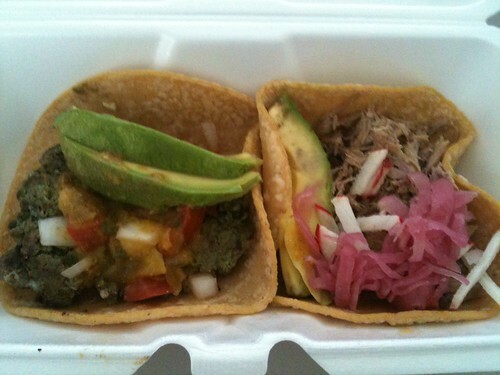 Right: Carnitas de Pato Taco ($3.79) – duck confit, avocado, vinegar onion, radishes, chile oil. Left: Wild Boar Chorizo Verde Taco ($4.49) – ground boar, Mexican spices, avocado, pico de gallo.